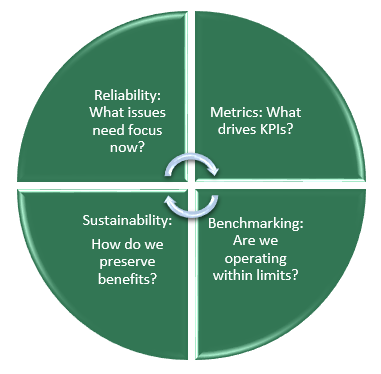 In order to improve operational efficiency, engineers must focus on four main components: reliability, metrics, sustainability, and benchmarking. With Envoy constantly monitoring your data, it is much easier to identify any issues that arise related to any of these components. We achieve this using our people, processes, and technology. 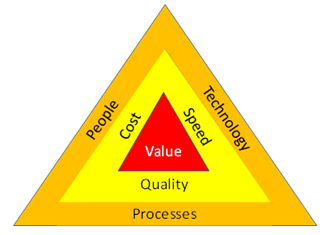 Respectively, these lower cost, increase speed, and improve quality, and all of them together add value to the customer. Throughout the day the Envoy database collects data from PI and then calculates statistics from this data. We apply filters to the data so that we don’t include data collected during downtime. In other words, we only use good data to calculate statistics. Automation is a central part of our technology. Not only do we automate the data collection and aggregation, but we also automate data analysis and reporting to maximize client value. The end user can then view real-time data with Envoy Process Monitor and perform long-term analyses using our Excel Addin. To complement our technology, we utilize various processes that facilitate getting useful information into the hands of our customers as quickly and efficiently as possible. Once per month, or when requested, we generate a comprehensive monthly report. This is a comprehensive technical review tailored to support site operations. We look at dozens of processes and have done so for quite some time. From this experience, we have developed an extensive knowledge base which provides a source for benchmarking, not only in terms of targets but in solutions. Take a look at our case studies to see what types of problems we can solve.